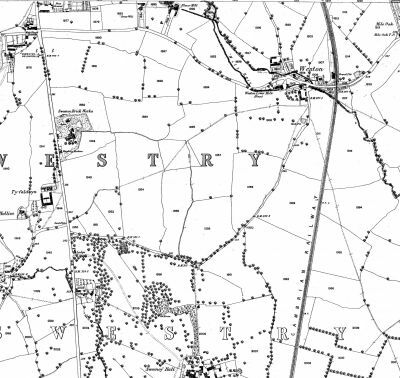 The Sweeney Pit was sunk by Thomas Ireland & Co. about 1836 and is shown on the 1837 Ordnance Survey map just to the right of the Oswestry to Llanymynech road (the current B5069) at Grid Reference 32893274). 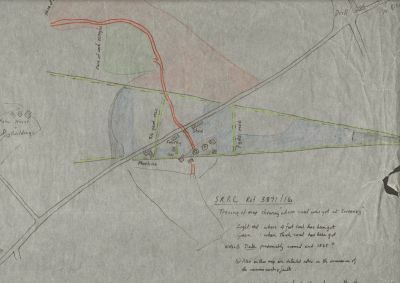 The pit was leased by Edward Croxon in 1842 who had also acquired the lease to the Drill Colliery a short distance north west from Thomas Ireland & Co. The coal seams worked by the Sweeney shafts were Rover at 419 feet, Black Shale at 435 feet, Upper Four Foot at 477 feet and Thick or Six Foot at the foot of the shaft at 499 feet. The Sweeney pit was however prone to flooding and from the mid 19th Century the coal seams were worked from the Drill Colliery. 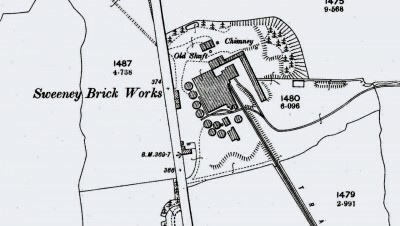 Blown up image of the brickworks site in 1901 only showing one shaft and a chimney to the right of the building. 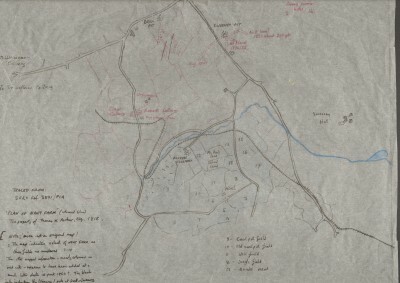 Tracing of a document showing the underground workings leading out from the Sweeney Colliery about 1840. 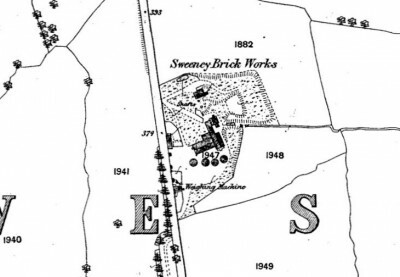 Tracing showing the underground workings of Sweeney Pit in the 1840/50's. 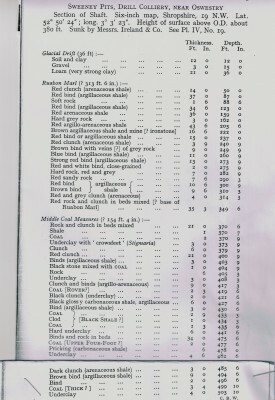 This document shows the extreme difficulty that the miners would have encountered as the dug down to find the coal seams. After digging down through various stratas, it was not until they reached 370 feet did they find the first coal seam (2 inches thick!!!) They continued down to 419 feet where they found a 2foot 3 inches seam. Down again to 433 feet to a 2 foot 9 inches seam. 435 feet to a 1foot 3 inches seam. 477 feet to a 2 foot seam and 499 feet to a thick seam ofr 3feet 4 inches.. 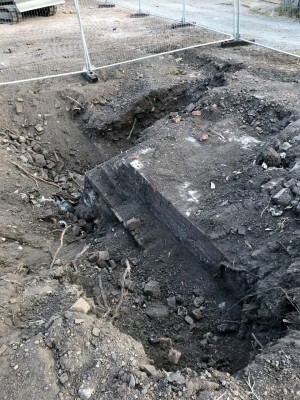 Recent photo taken (May 2018) of the top of the south pit at Sweeney brickworks unearthed during excavation works by a contractor preparing the site for a housing development. This shows the corner of a brick cap covering the mouth of the pit (probably 27 feet in diameter). The development has been suspended until further exploratory work is carried out. Recent photo of a building south of the above photo of the capped pit at Sweeney brickworks site. This building is in a poor state of repair and was believed for many years to have been garages. 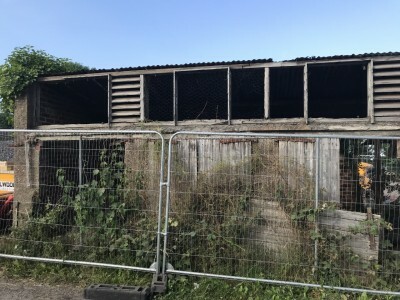 However looking at the front of the building and the wooden slats above the doors has led us to believe that this building had housed the pit ponies which would have been taken down either of the two pits that have been identified on this historic site. It is hoped that the building will not be destroyed if and when the building development takes place.